On March 31st the Mexican government took an American Marine hostage. His name is Sgt. 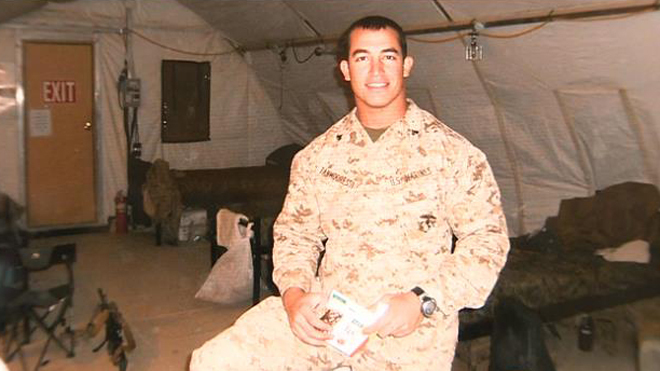 Andrew Tahmooressi. He is a two-tour of duty Afghanistan veteran. He recently moved from Florida to California and made a wrong turn into a border lane south of San Diego. He couldn’t pull a U-turn and get out of the lane so when he got to the gate he informed the Mexicans that he didn’t want to cross the border. He wanted to turn around. They detained him and discovered he had 3 legally owned firearms in his vehicle. He was arrested and has since disappeared into the Mexican abyss. He is currently being held in jail some 40 miles south of the border with a trial that started today. How nice? I’m sure the Sergeant is making some fine new friends in that Mexican jail. Beans and rice anyone? Chips and salsa? He has the chance of spending two decades behind bars for breaking the ‘no guns allowed’ laws of the fine country to our south. I’ve really had it with this. Where is our President? Where is our Secretary of State? I guess Mr. Amazing John Kerry brought it up recently with the Mexican President Enrique Pena Nieto, no word on the outcome. I’m sure Kerry speed dialed up Eric Holder to see if we had any weapons we could trade for our lost marine. At the end of the day, nothing has happened. Obama and Kerry are laughing stocks to the world. Go play golf, but you might hear something exploding real soon in old Mexico. Doesn’t a two-tour of duty veteran count for anything? Where is the outcry? Obama could use his pen and his phone and have the Sarge home for dinner tonight. Here’s how. Buzz the capital of Mexico with about fifty fighter jets at the same moment as El Presidente Nieto picks up the phone. Tell him it’s up to him if they start blowing crap up. Either send our marine home or he better head to the bunker cause it’s gonna get loud. Tell him he has one hour to have the Marine to the US border or they start dropping ordinance. I guarantee you would see the ants scurrying to load Sergeant Tahmooressi into a truck and hightail it to the border. But that won’t happen. We will issue a strongly worded email. Maybe send another envoy. Condemn this behavior to the UN Security Council, all the while our guy sits and rots. Time to go get him. Mount up. Lock-n-load. We’re burnin’ Mexican daylight. I’m pretty sure a small team of 10 of our best guys could find this Sergeants location and remove him from Mexico. On who’s authority? Semper Fidelis authority that’s who! With or without the Presidents authority we need to bring this soldier home. Uno, dos, tres, kaboom! Give us our guy back. We don’t leave people behind and we don’t let drug cartels or corrupt countries keep them as hostages. As our private marine operators leave old Mexico, there might be some black smoke and rivers of blood in their wake, but they would have the Sergeant with them, guaranteed. Don’t worry about getting across our border and back into the U.S. It’s wide open.